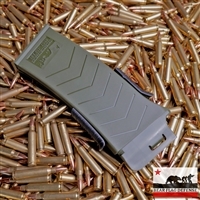 The BEAR FLAG DEFENSE BF-10 is a loading device for your AR-15's magazine while it's still in your firearm. Basically performing the same function as a stripper clip. We are behind enemy lines in New York State and this is just what you need for your NY SAFE Act AR with a permanent mag!